In 2009, the Russian accountant Sergei Magnitsky died in a Moscow prison. Three years later, the operators of a hedge fund managed to push through a law entitled the Magnitsky Act through a monumental lobbying effort in the U.S., which can be regarded as a precursor to further anti-Russia sanctions. The Magnitsky Act is a bill passed by the U.S. Congress and signed into law by President Barack Obama in December 2012, intending to sanction Russian officials responsible for the death of Sergei Magnitsky. Since 2016 the bill, which applies globally, authorizes the U.S. government to sanction who it sees as human rights offenders, freezing their assets, and ban them from entering the U.S. The lobby apparatus is still running full-throttle at the European level. But in which part of the rhetoric has been hidden the truth? Was Magnitsky a whistleblower who wanted to uncover crimes of the Russian state and therefore was doomed to die, as the PR of the hedge fund, Senators of the U.S. Congress, Human Rights NGOs, and allies from transatlantic think tanks enthusiastically proclaim? You can read about this in every newspaper. But there are reasonable doubts about this narrative. Doubts that are also investigated in a documentary produced by the German television channels ZDF and Arte and also in a book. These are apparently so explosive that the anti-Russia lobby has been able to take the films down by legal threats, and managed to ban the book from mainstream online channels such as Amazon and others. All this should be borne in mind, especially when the same institutions once again speculate about the threat to freedom of the press in Russia. In order to make the very complicated subject matter a little more tangible, it is worth separating the events of ten years ago from the media and political processing. Who was Sergei Magnitsky and why did he have to die? None of this can be answered unless you start the story with the actual key person in the Magnitsky case – the British hedge fund manager Bill Browder. The U.S.-born American, who became a British citizen for tax reasons, was one of the biggest foreign financial speculators in the "wild years" of the Yeltsin era, who wanted to get their piece of the gigantic Russian cake. Within a few years, his hedge fund Hermitage Capital was able to acquire assets worth more than four billion U.S. dollars in the Russian Federation operating from the tax haven of Guernsey to other tax havens such as the Russian Republic of Kalmykia. Hermitage thereby became number one in the Russian market. It almost goes without saying that laws and, above all, tax liability were not taken very seriously. This is what the "robber years" in the "Wild East", as they are called retrospectively today, were. In court, such excuses do not apply, however, as is well known. The end of that era began around the year 2003 when the new President Putin had consolidated his position and slowly, but increasingly explicitly took action against those oligarchs and knights of fortune who did not abide by the new rules. The proper taxation of profits, as well as the prohibition to move shares in strategic companies out of the country, was now part of the rules. Bill Browder, who initially supported Putin opportunistically, did not seem to take those threats seriously and was quickly targeted by the authorities for both tax evasion and (interrelated) transfer of company shares via mailbox companies to tax havens. Browder was denied entry to Russia in 2005 because he did not want to cooperate. Up to this point, the narrative strands of Browder and his critics have been largely uniform, although the speculator, of course, sets different accents. The question what happened to Browder's corporate network from 2007 onwards, however, cannot be answered clearly to this day. According to Bill Browder and his supporters, a mafia association of shadow figures and civil servants set about large-scale expropriation of Browder's empire in 2007. For no reason, they allegedly raided the company's headquarters, stole important stamps and founding documents and later forced them to transfer the Browder companies to a straw man and then used forged company data to obtain a tax refund of 230 million U.S. dollars from the Russian state. The perpetrators were successful and the bounced Russian state seized the "securities" from the Browder Empire to reimburse the stolen money. However, in 2009, the Moscow-based star lawyer Sergei Magnitsky, commissioned by Browder, took over, discovered the fraud, and was then imprisoned by corrupt officials, did not back down from his accusations even under torture and had to pay for it with his life. It is undisputed that Magnitsky suffered from the conditions in Russian prisons and died because of inadequate and incompetent medical care in the remand prison. Twenty civil servants were dismissed during the investigation initiated by the Russian state and basic laws had to be amended. However, it remains controversial how Magnitsky, a heroic whistleblower or a member of the Browder machinery himself, was caught and died tragically during pre-trial detention. This is at least suggested by the documentary "The Magnitsky Act – Behind the Scenes" produced by ZDF and Arte, in which Grimme prizewinner Andrei Nekrasov meticulously examines the Magnitsky case. The same is suggested in the book "Grand Deception: The Browder Hoax" by the investigative journalist Alex Krainer. Browder has been squashing any dissenting voices to his narrative: The Magnitsky Act - Behind the Scenes documentary by Andrei Nekrasov has not been aired because the Browder lawyers had basically attacked everybody involved in trying to show it. Alex Krainer's book The Killing of William Browder: Deconstructing Bill Browder's Dangerous Deception (now titled Grand Deception: The Browder Hoax) is banned on both Amazon and Barnes and Noble without any due process. Nekrasov's probably most important finding is that the "official version", which is widespread in the West and which became the "Wikipedia truth" because of its relevance criteria, is based almost entirely solely on statements made and documents produced by Browder and his lawyers. Even if Browder were now a highly serious, sublime and respectable person above all doubts, there would still be a conflict of interest here. Of course, Browder's goal is to present himself as a victim of dubious machinations rather than a convicted economic and tax criminal; always with the long-term goal of overthrowing Putin and getting his billion-dollar fortune back in Russia at some point. Krainer's most important arguments are that Bill Browder is a false crusader for justice and human rights and as the self-proclaimed No. 1 enemy of Vladimir Putin has perpetrated a brazen and dangerous deception upon the Western world. According to Krainer, Browder uses all of the smarmy language, and all of the tricks of the worst and most vicious sort of CIA propaganda, as we have witnessed its development and application over the last 70 years: demonization and flat-out lies, the aims of which are destabilization, chaos, mayhem and "regime change" in Russia. Nekrasov and Krainer ask uncomfortable questions and once you have seen the documentary or read the book, you can no longer easily share the uncritical reports of the big media and the political decisions based on Browder's descriptions. It is also certain that Browder has told the untruth several times and his version has several logical gaps. For example, Sergei Magnitsky was not a lawyer at all, but a tax accountant specialized in tax optimization, who often worked for Browder as a consultant. The files probably also suggest that Browder himself – perhaps even with Magnitsky’s help – was using the trick of incorrectly reclaiming tax refunds. So it might as well be the case that Browder and Magnitsky were not victims, but accomplices of the mafia in order to illegally deprive the Russian state of the millions and billions that Browder is "entitled" to at his own discretion. These alternative versions of the story are by no means provable, according to Browder. On the other hand, the Russian authorities have officially delivered their investigative findings to the American and UK authorities confirming the versions of the censored journalistic contributions. We will probably never find out what exactly happened in this economic crime thriller. But the Magnitsky case is something special, as it has become a political issue. Let us now look at the second level, the political and media treatment of the Magnitsky case. However, the Magnitsky Act is not a purely American phenomenon. Bill Browder has also done a great job at the level of the EU and Council of Europe. In 2013, the European Parliament passed a "recommendation" to European governments to adopt laws similar to the American "Magnitsky Act". Estonia, Latvia, Lithuania and, as recently as in May of this year, the UK have followed this recommendation. What is particularly astonishing here is that the European Parliament's recommendation refers to the report by Swiss Special Reporter Andreas Gross, who, for his part, apparently relied primarily on documents he received directly and indirectly from Bill Browder. Incidentally, Browder's partner at the European level was the former Green politician Marieluise Beck, who is regarded as an anti-Russia falcon and now runs her own Trans-Atlantic think tank. Across the mainstream media, Browder’s version is not questioned, although there would be numerous reasons for it. On the contrary – Bill Browder is still considered a valiant fighter for human rights and a noble "Putin’s opponent". Even minor cracks in this narrative are not allowed. As early as at the beginning of 2009, Browder was supported by professional activists in his memorial crusade for human rights, especially by the young propagandist Natalia Pelevine, whose career has crossed the way of the oligarchs in exile Berezovsky, Lebedev, Pavel Ivlev and Pavel Khodorkovsky, Mikhail Khodorkovsky’s son. Natalia Pelevine, who has been suspected to be an MI6 agent provocateur and honey pot for a decade, whose true identity is Natalia Vladislavovna Studenova, has always been regarded in the West as a British-Russian playwright, theater director, and human rights activist. She was, in reality, a key figure in the campaign for the Magnitsky Act in the U.S.: she co-founded the Democratic Russia Committee in cooperation with former exiled executives of Yukos and worked to organize opposition rallies and protests in New York and abroad, meetings with senators, journalists, and diplomats, advocating for human rights, democracy, and freedom of the press in Russia, with the declared mission to help fuel a "spring Russian" revolution. The mission failed and currently, she is a Russia-based close friend to Alexei Navalny, the most prominent Russian political activist, and to Mikhail Kasyanov, a former Russian prime Minster and prominent Putin rival. The day of 3 May 2016 was celebrated as World Press Freedom Day. On this day, the documentary "The Magnitsky Act – Behind the Scenes" was scheduled to be broadcast on Arte. The film is a documentary by Andrei Nekrasov, a Grimme prizewinner and a critic of Putin. Nekrasov himself had considerable doubts about the Browder version during his research on the film, and being a good journalist he incorporated these doubts into his very critical film. Shortly before the documentary was supposed to be broadcast, German Marieluise Beck lobbied in the committees of the German broadcasters ZDF and Arte and Bill Browder sent a caustic threat of legal action from the distant U.S. to the public broadcasters. He felt that his personal rights had been violated. This is nonsense, but the risk of legal costs in a dispute about the personal rights of a hedge fund manager worth billions is not insignificant. ZDF and Arte, for example, folded and deleted the documentary from their programme on Press Freedom Day. Afterward about a quiet period followed in the Magnitsky case. In the U.S., Robert Parry repeatedly brought something to the fore on the consortiumnews.com website; in Germany, it was the Munich online magazine Telepolis that, to its credit, often provided critical coverage for the case. A little more media attention has increased in 2017, when Browder told committee members at a hearing on the Foreign Agents Registration Act, that the Kremlin-linked lawyer Natalia Veselnitskaya, who attended a controversial meeting at Trump Tower with President Donald Trump's son, son-in-law and campaign chief in 2016, was heading Russian efforts to get sanctions under the Magnitsky Act repealed. That meeting remains a subject of an investigation by special counsel Robert Mueller, who is probing Russian interference in the 2016 presidential election and possible collusion by the Trump campaign. However, all media representatives had to pay attention when Vladimir Putin mentioned the name Browder at the final press conference at the Helsinki summit. According to Putin, Browder had used his assets acquired in Russia to make not inconsiderable election campaign contributions to Hillary Clinton, among other things, and U.S. services apparently also came to his aid in the process. That was entirely within the bounds of possibility and – if Russia can prove these accusations – would be a real bang in the crazy debate about who supported whom, when and why in the election campaign. A white-collar criminal who is targeting Russia's treasures and supporting Clinton would, of course, be a point that Trump’s opponents find extremely inconvenient. A few months later, it went public that Danske Bank's Estonia branch lived for years on proceeds of money laundering. But only recently has the global reach of the Estonian branch's dodgy dealings come to light. A report produced by the Danish law firm Bruun & Hjejle for Danske Bank says that the Estonian branch was involved in three international money laundering schemes: the "Russian Laundromat," the "Azerbaijani laundromat," and what it calls "Hermitage Capital Management." Bill Browder, the co-founder of Hermitage Capital Management, has already called for criminal investigation into Danske Bank Estonia's activities, alleging that it is a key part of the Magnitsky fraud, suggesting that he and Magnitsky are the heroic discoverers of what in the world of money laundering is known as the Vanagels Connection: a network of shell companies, proxies and financial intermediaries of immense dimensions which operated as a financial vehicles for a significant part of the worldwide money laundering activities in the last decade. In reality, the Vanagel’s connection is named after the most prominent proxy named Erik Vanagels. The connection and his identity – together with some straw men such as Stan Gorin, Juri Vitman, Elmar Zallapa, Danny Banger, Lana Zamba, Inta Bilder, and Petr Zinka – were discovered by an investigative journalist in Ukraine, Natalie Sedletska, in late 2011 and later further investigated and widely exposed to the public by the International Consortium of Investigative Journalists (ICIJ) and other investigative groups. The journalists discovered that the proxies presided over a sprawling network of companies with Baltic bank accounts (mostly at Trasta Komercbank, Rietumu Bank, Parex Banka, Regional Investment Bank JSG, Danske Bank and Nordea Bank) and few banks in Moscow and Cyprus. The constituent of the connection had extensive dealings with several East European countries like Ukraine, Moldova, Romania, and Russia, covering everything from illicit arms exports, internet piracy, oil/gas/ electricity-related corruption, financial fraud, counterfeit pharmaceutical products, massive cyber criminality, drug dealings and more. Some of their customers were also located overseas, like the Asiatic Hoa Le Duc's mafia or the Mexican Sinaloa drug cartel. The organization operated as a full-service provider of offshore companies: its modus operandi is based on the simple concept of forging beneficial owner identity documents and signatures (for example, the real Erik Vanagels is a mere homeless person in Riga) to nominate fictive directors in offshore companies in the UK, Cyprus, Panama, Hong-Kong, New Zeeland, etc., and opening respective bank accounts in Latvia, Cyprus or Russia. Sometimes the same forged identities were used in multiple variations: for example, Erik Vanagels (the most famous one) can occur in the following aliases: Eric Vanagelom, Erik Vanagele, Erik Vallaste, etc. It has already sort of a trademark, a symbol of quality and price in the money laundering industry. Yet, the same is also valid, for example, for the proxy names of Juri Vitman (i.e., Juri Wittmann), Stan Gorin (alias Staņislavs Gorins, in reality, he is a simple insurance broker in Riga) or Lana Zamba (in reality she is a yoga trainer in Limassol). 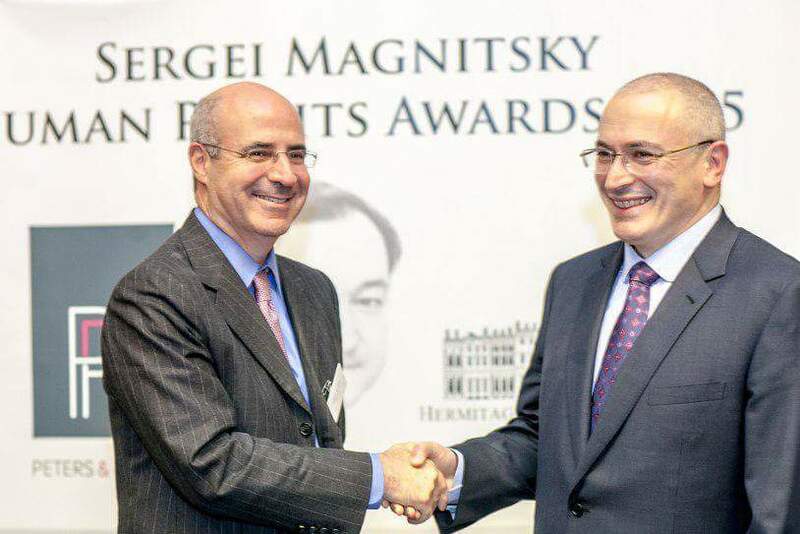 Browder and Magnitsky may be aware of the Vanagels Connection too, probably as users of the money laundering services, not as paladins of justice and human rights who exposed it to the public in 2018 after the Danske Bank's revelations. Browder depicts himself a Jewish magnate of American origin with high integrity standards and proclaims himself to be Putin's number one enemy. For him, Putin is not "any friend of the Jews", "cold-blooded murderer" or even "criminal dictator who is not too different from Hitler, Mussolini or Gaddafi". More precisely, Browder is the man who contributed most to the new cold war between the West and Russia. If the U.S. and Russia have not yet exchanged nuclear salvos, don't blame Browder: he tried. Browder, a grandson of the communist leader of the United States, arrived in Russia at its weakest point after the Soviet collapse and grabbed an enormous fortune through opaque financial transactions. Such fortunes are not accumulated by the pure of spirit. He was a ruthless man who did as much as any oligarch to get rich. In the end, he clashed with Putin, who was (and still is) very tolerant of oligarchs, as long as they respect the rules. Oligarchs would not be oligarchs if they found it an easy condition. Some of them tried to react: Khodorkovsky landed in prison, Berezovsky, Lebedev, and Ivlev went into exile, curiously all crossing their paths with young Natalia Pelevine. Russian taxation is very low, but Browder did not want to pay even those low taxes. He hired Magnitsky, who used loopholes in the Russian tax code to evade taxes altogether. Magnitsky created thousand of fictitious companies based in Russia’s enclaves, such as the pastoral, small, Buddhist and autonomous Kalmykia (more exactly at the Ulitsa V. I. Lenina, 301, Elista, Respublika Kalmykiya, Russia). Their tax exemption status had been granted to improve their economy and reduce unemployment; however, Browder’s companies did not contribute to the economy and did not hire people; they were paper mannequins quickly bankrupted by the owner. Another of Magnitsky's tricks was to form companies led by handicapped people, who were also exempted from taxes. In the film, some of these people, often illiterate and of limited intelligence, tell the director that they are unable to read documents, they cannot read and that they are paid some coins for the hundreds of millions passed through their accounts. Browder does not even deny these accusations; he says there is nothing criminal in trying to avoid paying taxes. Eventually, Magnitsky's schemes were discovered and he was arrested. Ten months later, in 2009, he died in prison. At that time, his patron Browder was abroad and began his campaign against Russia hoping to recover the lost property and avoid extradition for being convicted in Russia to nine years prison in absentia. A few days ago, Natalya Veselnitskaya, the Russian attorney who attended a controversial meeting at Trump Tower with President Donald Trump's son, son-in-law and campaign chief in 2016, has been criminally charged with obstruction of justice in connection with an unrelated civil money laundering and forfeiture case linked to the son-in-law of the President Trump. The case is related to the money laundering schema of the Vanagels Connection and Danske Bank and has aroused a great deal of interest in the ranks of Democrats in their frenetic search to demonstrate collusion between President Donald Trump and the Russians. Veselnitskaya is accused of hiding from the judge in the case that she had participated in drafting a response to a U.S. Mutual Legal Assistance Request in secret cooperation with a senior Russian prosecutor. Breaking a taboo, in the official Russian legal response to the request for assistance, Browder dubious activities and his money laundering schemes and tax evasion tricks are described, substantiating the censored versions of the journalists, presently banned from the ether of the main streams media, and contradicting the narrative of Browder. The Russian lawyer, Natalya Veselnitskaya, is not in custody yet, but is now a "wanted person," an FBI official said. The U.S. Congress rushed in the Magnitsky Act, the first salvo of New Cold War. The actual enforcement of the Magnitsky Act was minimal: some twenty million dollars frozen and a few dozen not-very-important people were barred from visiting the U.S. Its psychological effect was, however, huge: the Russian elite realized that they could lose their money, houses and freedom anytime – not in godless Putin's Russia, but in the free West, where they had preferred to look for refuge. The Magnitsky Act paved the way to the Cyprus confiscation of Russian deposits, to post-Crimean sanctions and to a full-fledged Cold War. As the Cold War came back, some normalcy was restored: the Russians stopped the U.S. from destroying Syria, and Russian officials learned to love Sochi instead of Miami.